Our range of products include Brass Twin Bell Alarm Clock, Brass Analog Table Clock, Brass Maharaja Working old Style Landline Telephone, Brass Landline Working Telephone Decorative Showpiece, Brass Gift Center Landline Antique Telephone in working Condition Decorative Showpiece and Solid Brass 5" Table Top World Globe. Features: 100% New Collection & High Quality Nightlight Function so you could hear the clock at night. 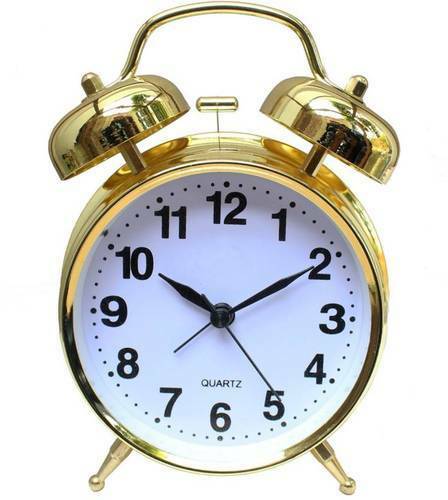 Metal twin bell alarm clock, very suitable for people who snooze Almost mute scanning, Clear alarm sound will surely wake you up. Will not miss the important meeting on the next day. Details: Material:Metal Color: GOLDEN. Feature: Ring Bell, No ticking/Silent Battery(not included) Package: 1pc x Desk Alarm Clock Back light vintage alarm clock to be kept bedside desk table clock for office and home use: Silent walking until it alarms. Light Function: if you press down the white button which is on the back of the clock, it can give out soft light so that you could know the time at night clearly. The unique and elegant Design fit for the bedroom, living room and study Loud Hammer Two Bell Alarm let you never miss the important time The shell is made of high quality Brass made by multi-channel process. Color of the shell lasts long. Specification Color: Golden. Battery:2 X AA battery (not included) Material: glass surface, metal body Package Content: 1*alarm clock. ANTIQUE STYLE This Table clock is full with classical style, dial is mottled, elegant and gorgeous, PERFECTLY SIZE Clock measures 5 x 2.5 x 2.5 inches, EXQUISITE WORKMANSHIP The modelling of the baroque is worthy of praise, HIGH QUALITY QUARTZ battery operated movement. Requires button cell (one included), To change the battery please rotate the back of the watch anticlockwise, it will come out and battery can be changed there. Caution: Please do not use knife or scissors to open the back of the watch. Antique Finish Brass Landline Telephone with rotary dial. Handicraft. Made from pure Brass. Black Color Fully Functional Telephone. Maharaja Design. Quality Home Decor Product & Excellent for Gifting also. Antique Look Telephone Model. Handicraft, made from pure brass. Golden Color Telephone. Excellent Home Decor & Gifting Product. World Map Globe from H.H traders. Ideal for Home Decor, Living Room, Office, Study Room.